當然，也不能在海外用信用卡購物或提款，而只能用手上有限的港幣台幣現金來過六天。還要回港後，等新卡和新密碼分別寄來，處理更改多間公司的自動付款，還要親身處理該月因信用卡失效而未能付款的帳單，還有不斷更改一些網上服務和 Verified by VISA。一個人能記得用了一張信用卡在那些服務嗎 ? CS forces me to report the loss of my card, the card I didn’t really loss it, but just stuck in the ATM. Above picture is simulating the screenshot of the ATM when my card is stuck in at its hanged system. Do you have a mouse for me to help you to close the dialog box ? or which key on left/right of the screen and keypad could help me to 「take back my card」 ? Before I depart to Taipei to speak at a conference, I just want to check my bank account and oversea cash withdraw setting, so this story tells us, don’t over trust the stability of banking system. I used HSBC for 20 years, but I didn’t hear about 「ATM hanged in this way」 and 「Oh! 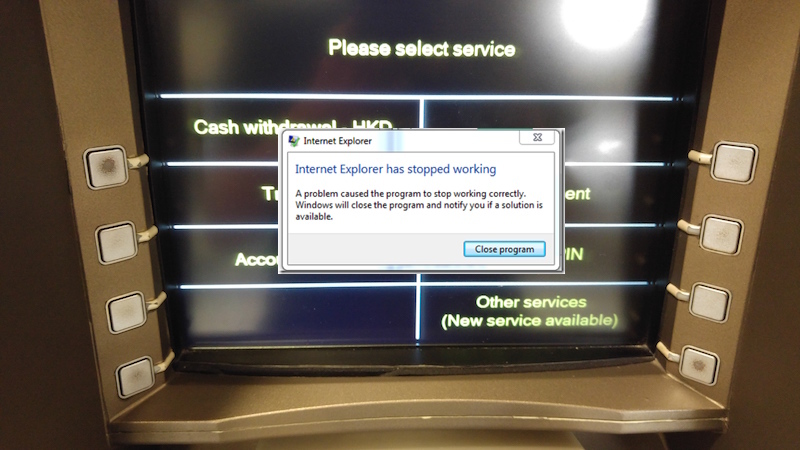 IE is running at HSBC ATM!」 (as well as IE Error!). So, when I was checking in at airport counter, I was also talking with HSBC Credit Card Hotline CS on mobile phone, she requests me to report the loss of my card. The most pity is that I ordered my air ticket and hotel room with this credit card. If air company or hotel request me to show this card, it will be in trouble. And the worst case that I have no hotel room for staying or staying at oversea airport. And I also can’t purchase and withdraw in oversea, and just use limited HKD and TWD cash for 6 days in Taipei. And after I go back to Hong Kong, I wait for few days to receive my new credit card and password, and then I should change credit card autopay for some bills, and pay in cash for all bills this month after the credit card become invalid. Before this happens, I didn’t believe such bad services happenings at HSBC services. This entry was posted in 旅遊 and tagged 機場 by Sammy Fung. Bookmark the permalink.